Sam’s Backyard wedding was one very beautiful celebration. Their design brief came directly from brief heaven: Cheese and Meat Plank (because we LOVE cheese) and make it look very pretty. EASY PEASY. Then add two of the most lovely chilled humans who trust what you do and leave you to making a creative masterpiece. Their families had both travelled from the UK for their wedding and they wanted to make it intimate and very special. The gorgeous house in Tascott was the most perfect location for their backyard wedding. The beautiful set out yard had a shabby chic theme with a touch of rustic and modern French Provincial. 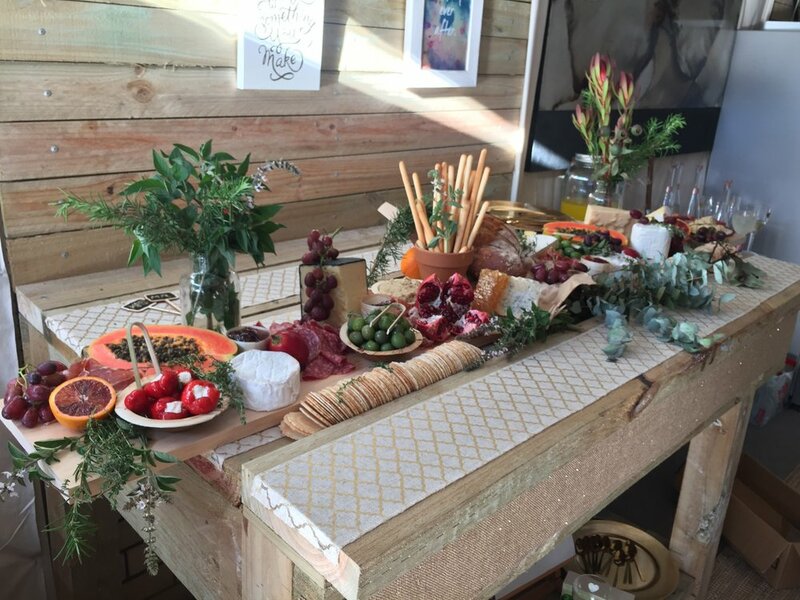 We had the amazing job of setting up an amazing 2.5 metre Cheese and Meat Plank. Featuring all the brides favourite things - Inferno salami, Lonza, Prosciutto, Manchego, Sicilian Olives, Duck and Shiraz Pate it was packed full and sparkled everything a cheese lover LOVES. We used natives and greenery to give a natural feel and to add that little Australian feel to their wedding. The beautiful herbs or Lemon Thyme, Basil and Rosemary made the room smell so delightful. With all the fresh summer fruits. Congratulations again to this amazing couple. You hold a very special place in our heart as you live only up the road from our beautiful little cafe and we love seeing you day in and out. Special shout out to the sensational Jess from Just a Piece of Cake who made her incredible cake just fit in beautifully with our Cheese Plank.